It is cold in Colorado. Last week we had a few snow showers and the mercury levels remain low ever since. So I decided to do what I love to do in this weather-baking.December is always a bake-a-thon time for me and this year is no exception. 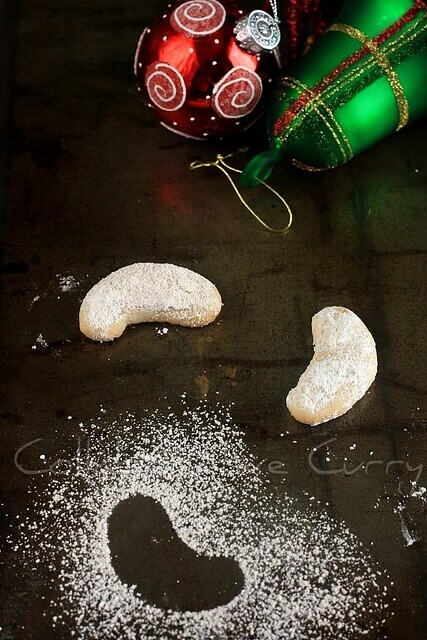 I have started with some sugar cookies and these beautiful Crescent cookies. Then I baked a couple more cookies, the recipes coming soon. Seems like I will have to bake another batch of crescent cookies for the goodies bags I share with friends, for these cookies will be gone in a couple of days.These will just melt in your mouth and the nutty-cinnamon flavor is irresistible. Everyone loves it and the cookie tin is almost nearly empty now.I love it when the kids like what I make/bake because the time went into it, is really worth it.If my son likes one cookie ,my daughter will probably love the other one. This is a great thing,because at the end of the day, I will have no leftovers ! We are really enjoying the 3 year old and the hysterical things he shares. He is the funniest little guy I've ever met. Those who read this blog regularly will nod their head in agreement, I swear.For those who do not know a lot much about him, here is a teaser.After coming back form preschool ,Lil M started to narrate all the stories from that day. He asked me "Mamma do you know what letter starts with "A" ? (He meant the opposite, which words start with A). I said "I don't know, can you please tell me ? " He said " apple and ants". The Mamma got really excited and asked what are the other words he knows. He got excited too and asked me " Mamma, do you know a word that starts with "B" ? I said "no". He told me "arm", but I heard it as "balm" or "yam". He got really upset and replied "Mamma, don't you know "arm" as in L-I-A-O !! He was just trying to spell it out for me. I couldn't laugh well thinking that he might get mad at me and stop eating his lunch ! The story doesn't end there. When his father came home, he started repeating all the words starting like, A for apple. He was quite successful this time in telling almost all the words correct and when he reached "M" he said, "M for Mac". I coudn't help myself from laughing this time.If Steve Jobs was alive, he would be real proud to hear this ! 1.In a food processor, process the almonds and sugar until almonds are ground very finely. 2.Soften the butter.Add the almond mixture into this and combine well.Beat until light and fluffy. 3.Stir together the flour and salt and beat them into the butter mixture,on low speed,until fully incorporated. 4.Scrape down the dough onto a plastic wrap.Press it into a thick disc,wrap it and refrigerate about a couple of hours or until the dough is firm. 5.Preheat oven at 325 degree F.Line 2 cookie sheets with parchment paper. 6.Divide the dough into 8 portions. 7.Work with one portion at a time, keeping the remaining dough in the fridge. 8.Knead the dough between floured hands until smooth and malleable. 9.Pinch off a portion of the dough and make a ball that is about 3/4 inch round. 10On a lightly floured surface roll the ball into a cylinder that is 3 inches long and 1/2 inch thick. 10.Shape each cylinder into a crescent and place on the cookie sheet about an inch apart. 11.Shape the remaining part of the dough. Each portion will give you 8-10 number of cookies. 12.Bake for 14-16 minutes or until set and not brown. 13.If you are placing both the cookie sheets, rotate them from top to bottom , half way through the baking period. 14.Cool the cookies on the sheets for 10 minutes. 15.Mix the cinnamon and sugar until you see no traces of cinnamon.Dip the cookies,using a pancake turner, one at a time, in the cinnamon sugar and coat them all over. 16.Cool the cookies completely on a wire rack and store in an airtight container. 17.This keeps good for one month at room temperature. Scrumptious and pretty elegant looking cookies,awesome they are..
yeah little ones are so funny and not to mention so clever, love these cookies and they look beautiful. 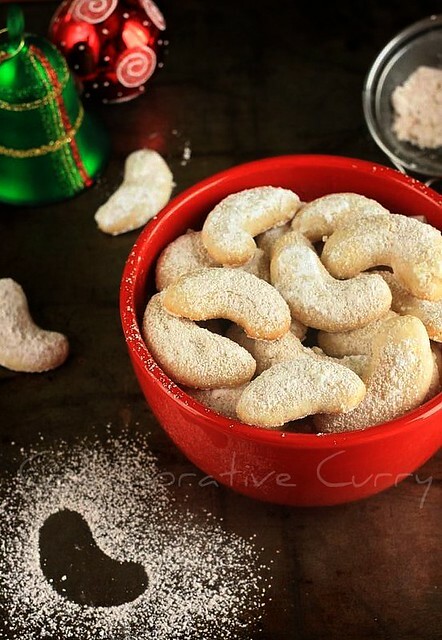 Hello.....lovely cookies ,christmassy look adipoli . Those cookies look great. Perfect for the festive season. 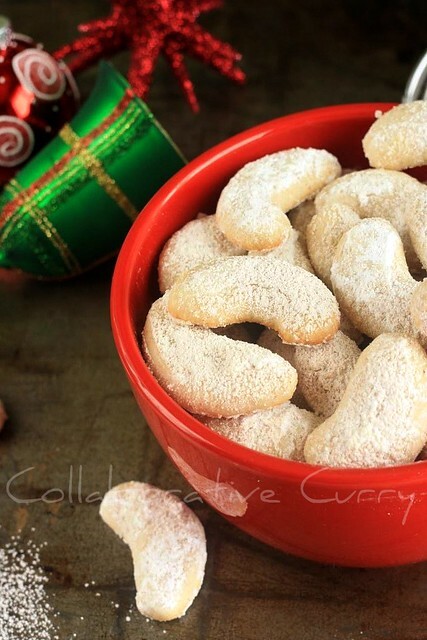 It's been a while tht I dropped by ur blog ...lovely to visit ur space and find these lovely cookies recipe perfect for chirstmas....Wishing u and ur family Merry Christmas and Happy New year! Cookies are very tempting love it. hi.. first time here.. cookies look really awesome... fabulous recipe.. They look beautiful and perfect like snowy the dusting! Super pics n super cookies chechi!!! lovely cookies...looks cute, perfect and beautiful....looks tempting and yummy...nice clicks too. One of my favourite holiday cookies! Thanks so much for your visit. Your 3 year old sounds delightful. from the time i saw there on maria's space ive been wanting to try them...sooo pretty they look.. These cookies look like a treat! yummy cookies and great clicks too! Looks nice crunchy and tasty cookies. 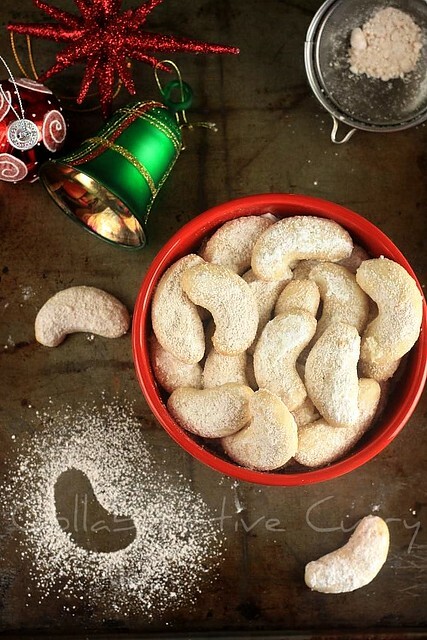 My mother makes these almond crescent cookies! Reminds me of the holidays! It is so good you have this blog to keep track of all the cute and funny things that he says! Gr8 pics!!! luv'd the sprinkled atta pic!! Wow.... Cute cookies and i think its good b'cos it doesn't have eggs. So Sure will try your recipe. Lovely cookies Nami... Beautiful pics too :)... Christmas preparation evidam vare aayi? cake undakkiyo? Besan Ladoo and Happy 2012 !